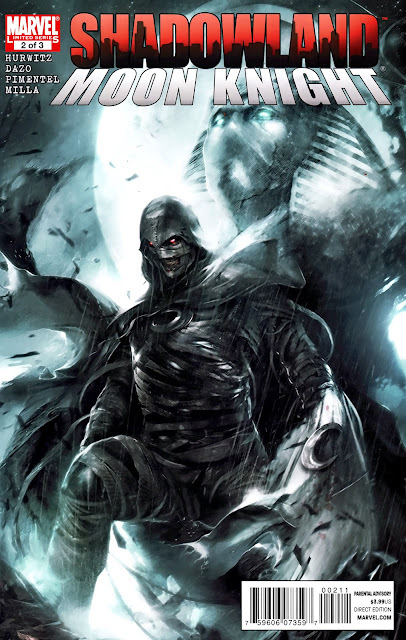 In my extremely humble opinion, Moon Knight is actually closer to The Shadow than Batman, due to the focus on mystical forces, multiple identities, and an unreliable narrator working with teams of agents. . .many of whom aren't aware of the character's other identities. Also, unlike Batman, both The Shadow and Moon Knight have a woman in their lives that keep them tethered to the real world and remind them that they are still human. It's these deeper layers of character that make Moon Knight stand out from the crowd of Marvel's costumed superhero "community". He's a deeply flawed character whose inspirational roots stretch back beyond Silver or Bronze Age sensibilities and into a time of mystery and magic. Moon Knight brings those pulp-era conventions forward into today's high-tech world and becomes a strange, unique figure that's more than what he seems on the surface. The modern crimefighter and golden age mysticism mixture is one of the reasons why Moon Knight is one of my favorite Marvel characters when I'm really not much of a fan of traditional costumed superheroes. There's a BIG problem with Moon Knight in that he's not an easy character to get right. Reading the various volumes of Moon Knight comics is about as schizophrenic as the character himself. The portrayal of Moon Knight swings wildly from introspective to psychedelic to typical superhero punch-fest as each new writer tries to get a handle on the character. The continuing narrative of Moon Knight comics is as unstable as Marc Spector's mental state. So what we have here is a 3 issue miniseries that is part of a larger overall crossover of Marvel's more "street level" heroes. It finds Moon Knight as a solo Vigilante on the streets of New York again after a stint of taking orders and working with a team as part of The Secret Avengers. Daredevil has become the leader of the ninja assassin death cult known as The Hand and has started a brutal takeover of New York from his fortress/prison, Shadowland. Moon Knight is dragged back into working on a team trying to stop Daredevil by Steve (Captain America) Rogers. So. . .Moon Knight at a crossroads between being a team player and doing his own thing. Can the writer capture the mystic essence of Moon Knight, or will we just get "Marvel's Batman"? First off. . .what a cover! Definitely worthy of a frame on the wall. It perfectly captures that mystic essence of Moon Knight I was talking about in the intro. Moving along. . . The first page starts us off with a very welcome and surprisingly comprehensive rundown of where things are at for Moon Knight and Daredevil at the beginning of this story. It's a nice touch that blows a bit of dust off of this almost ten year old story and kept me from having to go to Wikipedia. I'm gonna save a bit of writing and just throw it in here for you. For the first time in a long while, Moon Knight (currently living in his streetwise Jake Lockley personality) is actually happy. He's out on the street taking down the kind of criminals that The Avengers ignore. He has his team back on his side helping him fight crime, and he's loving it. He's managing to keep the voice of killer Moon God Konshu demanding blood in the background and being a hero on his own terms. The love of his life (Marlene) is back in love with him and they are living together, planning to get married. Marlene is pregnant, so for the first time Moon Knight is gonna be a daddy! It's not that the mental battle is easy. . .it's never easy. But generally speaking, things are good. You know and I know that Moon Knight isn't destined for happiness. Unknown to him, Daredevil has hired The Profiler to take Moon Knight out. The Profiler figures out that Moon Knight's power is based on his belief that he's unique, and that by taking that away he will be easily defeated. So he does some digging until he can find one certain special individual (Spoiler alert. . .it's Randall Spector, Moon Knight's brother) to manipulate into believing that he is to be Konshu's new avatar of blood and death. It just HAPPENS to be a nice bonus that Randall was exposed to strange radiation during a military mission that enables him to project energy blasts from his eyes. Profiler turns him loose on New York where he begins a brutal series of killings, leaving taunting notes at the scenes for Moon Knight and calling himself Shadow Knight. Moon Knight rises to the occasion and begins the hunt for Shadow Knight, but as he hits the streets searching for clues in his Jake Lockley persona, his investigation is interrupted by Steve (Captain America) Rogers and he is recruited to run a recon operation inside of Daredevil's "Shadowland" fortress by allowing himself to get captured in order to feed intelligence from inside. But while Moon Knight begins working undercover for Captain America, Shadow Knight attacks his mansion and brutally assaults the pregnant Marlene. End of issue. . .
Not a bad setup issue at all! It's not often we get Moon Knight in a good place. . .even though we ALL know it's not going to last. I really would have liked to see it last a little longer than most of one lousy issue, though. I wouldn't mind seeing THIS Moon Knight out on the dirty streets and joking with his team while kicking a$$ go for a while in an ongoing. . .but it is what it is, and it didn't last long at all. A damn shame. As far as THIS story goes, it seems a bit strange that Moon Knight would just drop his hunt for a brutal killer leaving him taunting notes in order to start taking orders from Steve Rogers again. . .but crossovers gotta crossover, I guess. To tell the truth (and getting ahead of myself a bit), this mini would have worked perfectly fine without ANY Shadowland connection. The Profiler angle is good and it works nicely, but Randall Spector (it's not revealed that's who it is until next issue) having some drag and drop convenient superpowers is extremely weak. Weak story elements aside, the art in this issue is outstanding in every way! It's exaggerated and cartoony, yet extremely detailed at the same time, with bold colors contrasted by heavy inks that perfectly compliment the shadowy nature of a character like Moon Knight. Every single page is a feast for the eyes. Overall, this is a great first issue. It has a Moon Knight I really want more of and is backed up by fantastic art. The crossover elements are the weak link, but other than that this is a very nice start. After a pretty tight first issue, the second one drops us right into Marvel crossover Hell! We get immediately dumped into an extremely busy double page spread of a major battle scene featuring a handful of Marvel "Street Heroes" (and Ghost Rider) fighting a metric $hitload of ninjas with no explanation on the very first page. . .
CLICK ON THE PIC FOR FULL NINJA-TASTIC EFFECT! Damn, Marvel. Why'd you have to go and do that to me? No sweet talk. . .no dinner. . .just BAM! NINJA BATTLE! right there on the first page. Not that I'm against a good ninja battle, I just like to kinda ease into them a little bit. Obviously, SOMETHING has gone on in the larger Shadowland crossover (that this mini is a part of) between the first issue and the second of this story that has caused all hell to break loose in Daredevil's ninja prison/fort. I don't have any of the issues involved, so I'll just try to make sense of things as best I can. Moon Knight manages to break out of his prison cell and joins the ninja fight draped in a bedsheet. Even though Daredevil has the likes of Ghost Rider, Spider-Man, Iron Fist, and Luke Cage laying waste to his minions, he decides to go mano-a-mano with Moon Knight and proceeds to beat him like it's his favorite thing to do while the ninja battle rages around them. 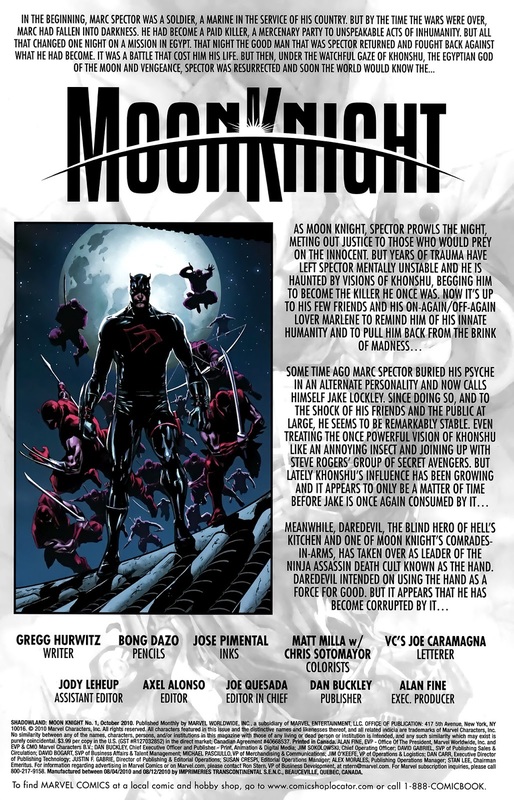 During the fight, Konshu steps into Moon Knight's head to show him that Daredevil is possessed by some sort of demonic being that can only be destroyed by an enchanted sapphire crescent created centuries ago in Egypt. . .a crescent that just HAPPENS to be the moon symbol on top of the staff that was part of Konshu's statue in Egypt that turned Marc Spector into Moon Knight! What a coincidence! Furthermore, Konshu lets Moon Knight know that Shadow Knight is after the moon symbol as well. . .and so both paths of this story congregate in one shiny enchanted deus ex machina! After Konshu's exposition dump, the next scene shifts (with no explanation) away from ninja hordes and an evil Daredevil gleefully punching Moon Knight through walls to Moon Knight arriving at his mansion to find Marlene almost dead and the baby miscarried. This drives Moon Knight to grit his teeth and agree to kill for Konshu again if he will lead him to Shadow Knight. Konshu accepts and Moon Knight heads out for revenge! "Hero Crashing Through Window" Never gets old! 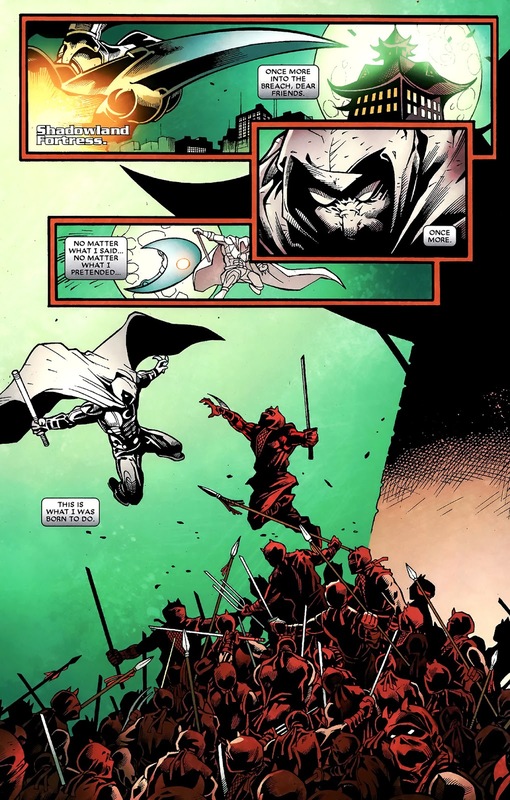 Moon Knight finds Shadow Knight in the process of murdering a woman. He stops the killing and an epic battle between the two "Knights" ensues. 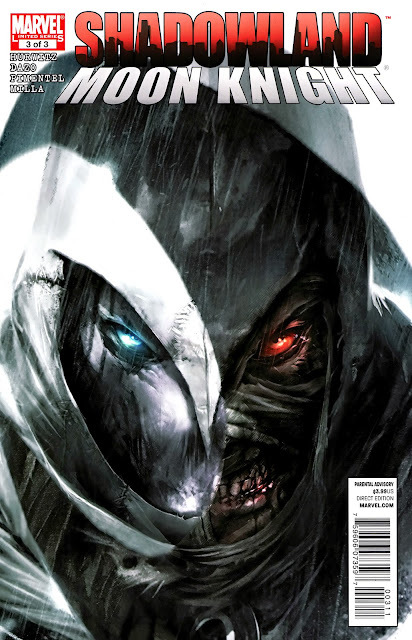 Shadow Knight realizes that Moon Knight is out for blood and he's outclassed, but Moon Knight relentlessly pursues him until the two confront each other in a church and Randall Spector reveals his identity. This issue isn't bad, but it has some definite problems that are actually part of my problem with Marvel in general and one of the main reasons why I buy so few Marvel comics these days. It takes a perfectly good Moon Knight story that started in the first issue and then just throws you right into a ninja battle that really has nothing to do with what happened previously. And then it jumps back into the story at hand without so much as a transition page. This isn't really the place for a general Marvel crossover rant, but it has a major impact on this particular issue, and I've dropped a lot of Marvel books through the years because they become hopelessly embroiled in multi-title year long crossovers that I just don't want to buy all the parts for. This is an interesting MOON KNIGHT story. . .the crossover parts of it are the worst part. 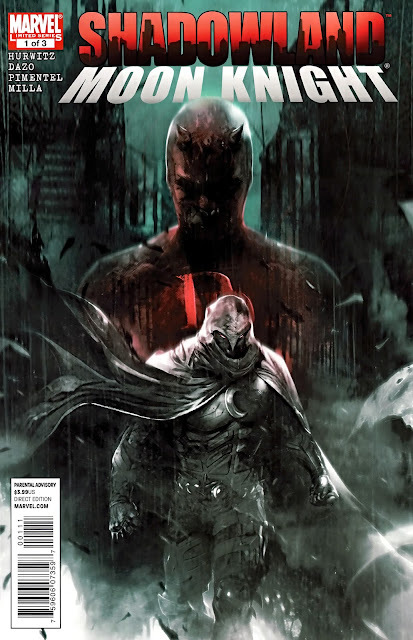 You have Moon Knight being relatively happy and at peace with himself for the first time in a long while, and then that happiness is ripped to shreds by a killer specifically taunting him and hitting him in the two places where it hurts the most. . .his identity as a hero and the woman he loves. Moon Knight throws aside his self-imposed moratorium on killing to seek revenge and discovers that his enemy is his own brother! THAT'S a good story! All this crap about demon-possessed Daredevil, ninja battles, Ghost Rider and magical sapphire crescents is just in the way of the story I want to read. Overall, the story at the heart of this is a good one and the art remains outstanding in every way. Unfortunately, the crossover aspects forced on the reader drag down what is otherwise an excellent Moon Knight tale. 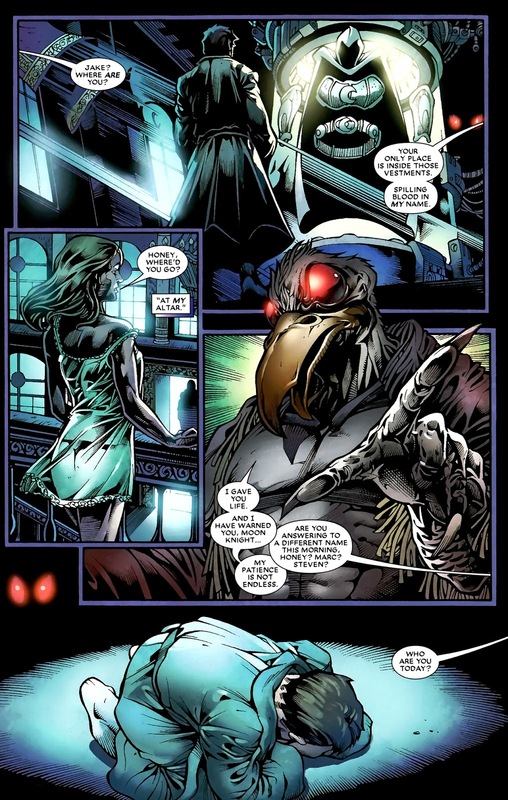 Continuing directly from the cliffhanger reveal of Shadow Knight being Randall Spector on the last page of issue two, we pick right back up with the battle between the two "Knights" as Shadow Knight pulls out his powers and temporarily turns the tide of the fight in his favor with some energy blasts that allow him to escape. 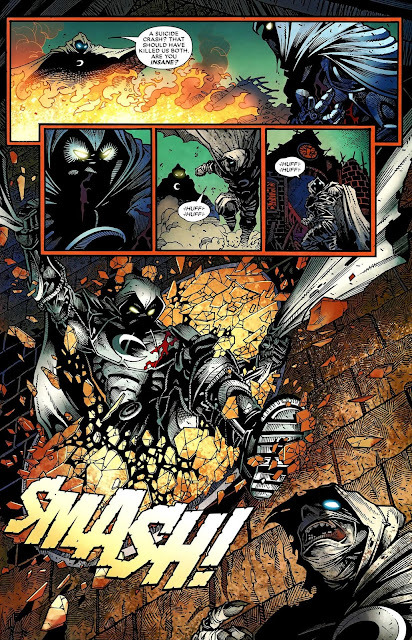 Moon Knight is understandably upset to discover that Shadow Knight is his own brother, and even more so when Shadow Knight continues his killing spree. Konshu steps in and reminds Moon Knight that he promised him some of that sweet, SWEET revenge blood and didn't deliver. . .so he gives Moon Knight another chance and reveals the location of the sapphire crescent as being in New Orleans. . .and where the crescent is, there's where Shadow Knight will be too. So it's off to N'Awlins. As Mardi Gras parades and party crowds fill the streets of New Orleans, Moon Knight follows Konshu's clues to a fortune teller, where he acquires the sapphire crescent through the mighty power of cash money. . .only to lose it as soon as he calls Captain America to tell him he's got the Maguffin and it's time to take down Daredevil. A chase through the crowded streets of costumed party people eventually leads to a confrontation between Moon Knight and Shadow Knight where Moon Knight reveals to his brother that he's been duped by Profiler into thinking he's Konshu's new avatar, when really Konshu has sent Moon Knight to take him down. . .trying to end things before he's forced to spill his own brother's blood. Randall refuses to believe he's on anything but a holy mission to destroy both Moon Knight and the Sapphire Crescent. They continue to battle until Shadow Knight finally realizes that he's just no match for Moon Knight. A beaten Randall reveals that he's wearing an explosive vest and that he's willing to blow himself up along with the crowd surrounding them who have been watching the fight. Moon Knight decides that his brother is lost and he's not going to let him take any more innocent lives, so he throws the sapphire crescent and beheads Randall. . .feeding a gleeful Konshu's bloodlust. At the end of it all, Moon Knight returns to New York and heads back to Shadowland for another massive ninja battle. . .fully accepting his role as a hero once again. That's a LOT of ninjas! We get a one page epilogue where it's revealed that Moon Knight is once again living in his original Marc Spector identity that he went to a lot of trouble to try and erase. NOW it's the end of the issue. Thankfully, this issue concentrated a lot more on the Moon Knight story instead of the Shadowland story. Sure, there were still elements of Shadowland in here. . .it IS part of a crossover after all. . .but they weren't nearly as intrusive and out of context as they were in the second issue. I really liked the direction it SEEMED things were heading at the end of this story. Unfortunately, the next volume of Moon Knight didn't really build on this. Instead we got another complete re-invention of the character set on the West Coast with Marc Spector being a T.V. 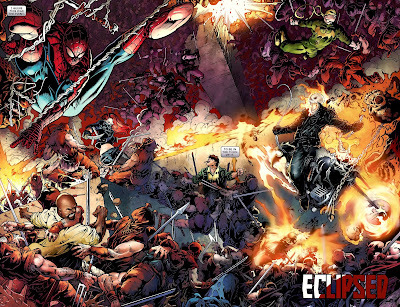 producer and having NEW multiple personalities of Captain America, Wolverine, and Spider-Man as part of him. I have that full crappy run, so I might go ahead and throw it in Longbox Junk some day. It's pretty bad from start to finish and only lasted 12 issues. It's a bit confusing how they got from here to there, and it's a damn shame that they seemed to have scrapped the new status quo established in this story (beyond Moon Knight being Marc Spector again) because THIS is the kind of Moon Knight I like to read. . .struggling against himself, but doing his best to be the hero he knows he can be. Overall, this is a great Moon Knight story backed up by fantastic art. Unfortunately, it's also part of a crossover and those elements distract from the story that is actually being told. . .especially in the second issue. Looking beyond the Crossover, we get Moon Knight trying to discover what kind of hero he really is. . .and we find out that he's the kind of hero that will kill if he has to, but that doesn't mean he has to like it. If you are a Moon Knight fan like I am, I can definitely say that it's worth a look. You just have to sort of grit your teeth through the crossover elements that intrude into the Moon Knight story you actually want to read. X-Men: Phoenix - Endsong 5 issue mini. Great review! You always give me things to put on my "watch for these comics" list while I'm digging around in discount longboxes. Love your assessments and I'm glad you do what you do. I was looking forward to this particular review, and was not disappointed one bit. I quite enjoyed your take on Moon Knight in general as a character. He is definitely not a Batman copy. Completely agree with the different takes on his character over the runs. This is one set I do not have, but will be looking for. The story as you described sounds to be great. The artwork itself as shown is pretty tight as well.